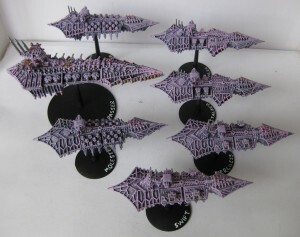 Battlefleet Gothic Chaos – is this the quickest project I’ve ever finished? So, I suspect this is the quickest that I’ve ever managed to finish a project from purchasing it to having it all painted up and ready to play. My new Battlefleet Gothic Chaos fleet arrived just over two weeks ago, and in the space of two Sunday gaming nights at the ANU Wargaming Society I managed to assemble and then paint them up (I did undercoat them in the time between though). 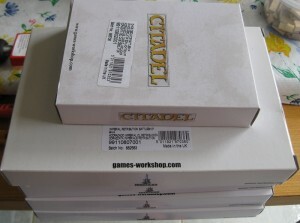 To add to my current projects, I’ve also bought a 1500pt Chaos fleet for Battlefleet Gothic. Oh, and a third battleship for my Imperials. I should really stop buying stuff, although with the exception of the new Napoleonic British project I’m still sticking to my “no buying stuff that doesn’t fit in my existing figure cases” rule. I guess I have a lot of work to do!